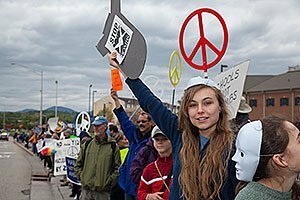 Opponents of continued nuclear bomb production marched through the streets of Oak Ridge, Tennessee to the gates of the Y-12 nuclear weapons plant. They opposed the government’s plan for a new $6.5 billion Uranium Processing Facility that will build key parts of thermonuclear bombs. Several Japanese Buddhist monks walked eight days from Asheville, North Carolina to join the protest.